In the first decades of the nineteenth century, no place burned more brightly in the imagination of European geographers––and fortune hunters––than the lost city of Timbuktu. Africa's legendary City of Gold, not visited by Europeans since the Middle Ages, held the promise of wealth and fame for the first explorer to make it there. In 1824, the French Geographical Society offered a cash prize to the first expedition from any nation to visit Timbuktu and return to tell the tale. One of the contenders was Major Alexander Gordon Laing, a thirty–year–old army officer. Handsome and confident, Laing was convinced that Timbuktu was his destiny, and his ticket to glory. In July 1825, after a whirlwind romance with Emma Warrington, daughter of the British consul at Tripoli, Laing left the Mediterranean coast to cross the Sahara. His 2,000–mile journey took on an added urgency when Hugh Clapperton, a more experienced explorer, set out to beat him. Apprised of each other's mission by overseers in London who hoped the two would cooperate, Clapperton instead became Laing's rival, spurring him on across a hostile wilderness. 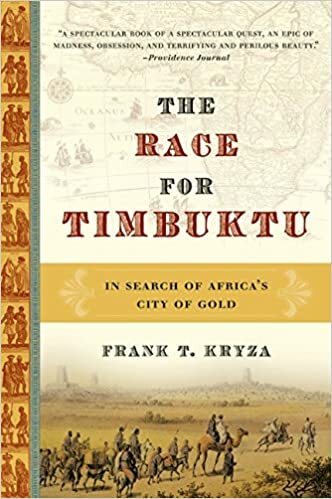 An emotionally charged, action–packed, utterly gripping read, The Race for Timbuktu offers a close, personal look at the extraordinary people and pivotal events of nineteenth–century African exploration that changed the course of history and the shape of the modern world.